2K Sports aces the competition with this hard-hitting and portable tennis game. Top Spin 3 for DS is a lot better than its Xbox 360 counterpart. Whereas the console game has a punishing learning curve and unresponsive buttons, the portable version is easy to learn and play. It's also got plenty of sweet tennis content to keep you busy, whether that means challenging a friend or entering a tournament against the computer. Being that it's a DS game, Top Spin 3 doesn't contain nearly as many features as the other versions, but what's here is good. You have 16 players to choose from, including Roger Federer, Maria Sharapova, Andy Roddick, Justine Henin and Amelie Mauresmo. You also get 10 venues from around the world, such as Melbourne, Paris, New York and London. Everything is displayed in impressive 3D for a DS game, with well animated polygonal characters and attractive courts packed with screaming fans. 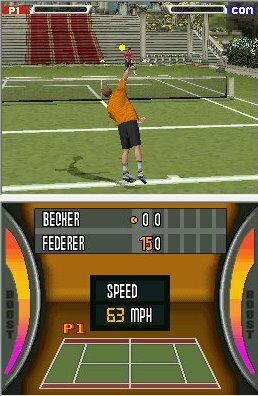 It looks ugly compared to the Virtua Tennis games on PSP, but considering the limited technology, 2K Sports did a great job, especially since the frame rate is consistent. When it comes to gameplay, Top Spin 3 delivers. 2K kept things simple, eliminating the need to worry about inertia and making it easy to move with the d-pad and hit with the A (Safe Shot), B (Top Spin Shot), X (Lob Shot) and Y (Slice Shot) buttons. You can also put some oomph on your swings by pressing the left and right triggers, though you'll need to time it just right to avoid going out. It doesn't take long, however, to get the hang of things, and before you know it, you'll get into long volleys with the computer and make plenty of game winning shots. Furthermore, three levels of difficulty let you sharpen your skills against worthy opponents. Aside from Play Now (Exhibition) mode, there's Career, Tournament, Mini Games and Multiplayer. Career lets you build a tennis pro from the ground up and enter him or her in a series of tournaments, the goal to go from 100 in the world to numero uno, improving your skills as you go. Create-a-player is limited, but you can still change skin tone, hair color and outfits. Tournament just lets you quickly hop into a competition, just in case you want to avoid all of Career's intricacies. Mini Games, on the other hand, offer you eight enjoyable activities, such as knocking over blocks or destroying a car by smashing the ball into it. Multiplayer, on the other hand, lets you wirelessly challenge a friend via AdHoc, though you'll both need a copy of the game. Despite being fun, Top Spin 3 has some issues and omissions beginning with its roster. Both Nadal (the newly crowned Wimbledon champ) and Venus and Serena Williams are missing, which probably has more to do with money and the fact that Nadal has his own DS game. That doesn't bother us as much as the presentation, which is bland and uninteresting. Not only does the game have boring menus and a weak soundtrack, but there's also no music during play. Sure, the pop the ball makes off the rackets is cool, but we need something more to feed our ears. With everything taken into account, those are small and nearly insignificant issues compared to the greater whole, which is good. Top Spin 3 isn't flashy, but it's fun, and if you need a tennis game for DS, this one is aces in our book. What's Hot: Decent 3D graphics, addictive gameplay, fun mini games, enjoyable career mode. What's Not: Weak presentation, limited create-a-player, no Nadal or Williams sisters, no doubles.